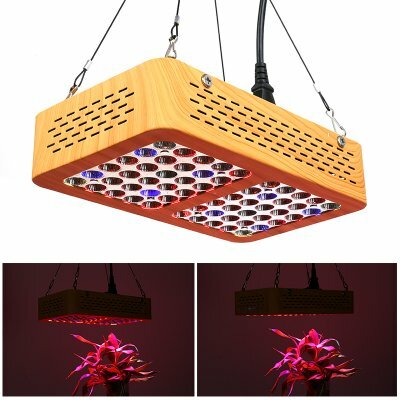 Successfully Added 300W LED Grow Light - 60x LED, 50,000h Life, 60-Degree Light Angle, Wide Wavelenght Range, 2900 Lumen to your Shopping Cart. With this high-end 300w LED grow light, you’ll be able to grow plants and vegetables like never before. It holds a total of 60 powerful LEDs that together produce up to 2900 lumen. Your grow light features different types and colors of light as it comes with 4 pink, 8 blue, 4 green, and 44 red LEDs. Thanks to this, your grow light lets you apply the right type and color of light to boost the photosynthesis of your plants. This will significantly increase the growth and yield of your homegrown flowers and vegetables. With an expected life expectancy of 50,000 hours, this LED grow light will treat you to stunning indoor gardening results for years to come. LED grow lights are the perfect gizmo for those of you that wish to grow plants at places with limited natural light. If you find yourself in such situation, your grow light will offer a helping hand by providing artificial light to your flowers. With its different lights at different frequencies, a LED grow light lets you provide the exact type of light that your plants need. Therefore, it lets you fully optimize the blooming and yield of any particular flower or vegetable. With this amazing gadget, your flowers will be able to grow properly at any place imaginable. This powerful LED grow light comes with a 60-degree light angle. It is capable of providing light to several plants at the same time. Compared to frequently used fluorescent lights, LED grow lights offer a cheap and energy efficient alternative. They let you grow your favorite plant at any time of the year without needing to worry about your electricity bills. This 300w grow light comes with a 12 months warranty, brought to you by the leader in electronic devices as well as wholesale electronic gadgets..